Brechin Cathedral will be immortalised in LEGO to mark the historic milestone in 2020. The model will be made from around 10,000 specially designed bricks created by Bright Bricks, a company who take digital images of buildings and tesselate them onto bricks. A test model of Brechin Cathedral produced by Bright Bricks. Image supplied. The bespoke design is then split up into modules with expanded photographs and a guide to how to create the model. 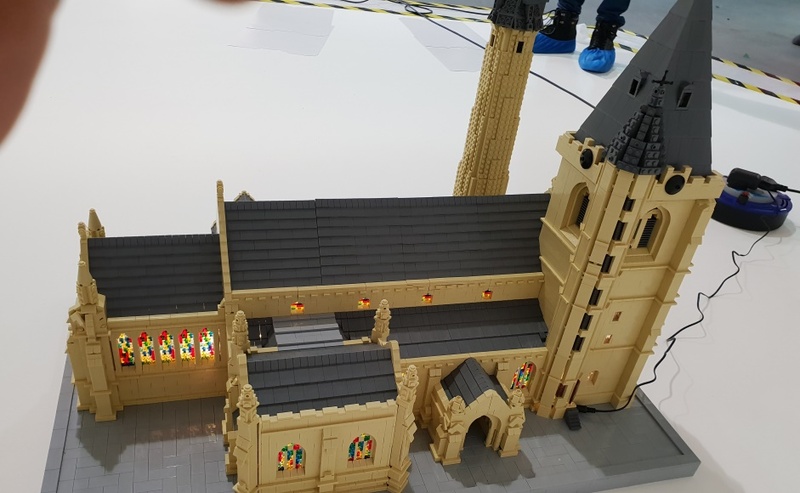 The project, which will entail members of the public buying a brick for £1, was inspired by a LEGO model of Durham Cathedral which was completed two years ago. It is described as “the largest LEGO model ever built by the public”. Although Brechin’s model will be smaller, anniversary celebration organisers say it is no less significant. Steve Dempsey, chairman of Brechin 2020, said: “I think that people will be excited about it. “Any extra money that we recoup will be used for educational purposes for the Cathedral. The model will be mounted on a base roughly three feet by two feet in size and feature LED lights to illuminate the stained glass windows. Mr Dempsey, a member of the Cathedral congregation, said the group’s ambition is that as many people as possible in Brechin place a brick. “We want to involve children and young people,” he added. “We will visit local schools so that every child has a chance to lay a brick and be part of Brechin 2020. The LEGO model project will launch in October of this year, with the final brick to be laid at the octocentenary celebration in June 2020. The 13th century Cathedral has a distinctive 86ft high Round Tower, one of only two in Scotland. As part of the wider Brechin 2020 commemorations, a medieval market, a concert and a piece of street drama will take place. Mr Dempsey said: “The project has a number of themes, one of which is legacy. “The LEGO model will form part of that legacy, but only part. “What we think is important is getting our message across and getting people involved. “What we really want to do is breathe life into the building, whatever it takes. The congregation of Brechin Cathedral is currently facing financial difficulties.